Traveling with your family can be stressful. Don't let all the hassles of family vacation and travel planning keep you from making those memories. Vincent Vacations can assist with travel ideas behind family travel packages and deals, leisure travel, adventure, elite travel and more! Looking for the perfect all inclusive family vacations or the perfect vacation ideas for spring break or summer? We can help! Read more about our Disney vacations - ideas and packages. A trip to Disney World is on every family's must do list. It looks easy enough and then you realize there are 27 onsite Disney hotels and villas and then there are partner hotels and off site hotels. Is your head spinning? There are over 100 restaurants within Disney World including about 70 full service restaurants but which ones are the best? Are there off site restaurants that are must dos? Don't spend your hours upon hours reading online forums; just give us a call! No fees for your resort bookings and every booking comes with all the magical service and attention to detail we give our own trips to the happiest place on earth! Here is Chris and Lia (and Jack) in the park early to try Cinderella's Royal Table breakfast! Awesome breakfast and great photos. This one has to be reserved early and your dining plan can be used for it. More details when you book your Disney Vacation with us! Read more about our Beaches Resorts - ideas and packages. Beaches is the ultimate all inclusive family vacation. 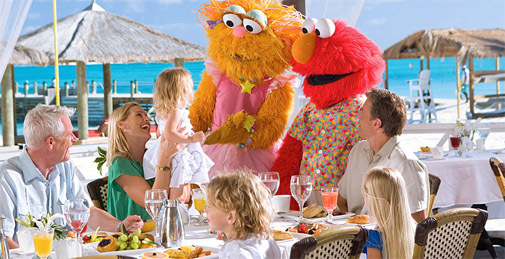 Beaches luxury resorts in Turks and Caicos and Jamaica, provide fun for kids and adults alike! They have been voted the best all inclusive family resorts year after year. Let Vincent Vacations plan your family all inclusive resorts today! Read more about our Hawaii Family Vacations - ideas and packages. Read more about our Atlantis Family Vacations - ideas and packages.